More news from the irrepressible Eric Trupheme at Ocean Independence as he signs the 29m motor yacht Virginia Mia for sale. Built in GRP by Spain's Astondoa yard in 2001, she boasts a calm, uncluttered interior by the design team of Nuvolari Lenard accommodating eight guests in four staterooms. The master suite features a king-size bed and large en suite with a Jacuzzi tub, shower, double sinks and a vanity unit. There is also an en suite VIP stateroom with a queen-size bed and a twin cabin with en suite facilities. The saloon and master suite feature 42-inch Sony flat screen plasma television screens. On deck, there is a convertible office/stateroom with a king size sleeper sofa and en suite shower and head. The aft deck offers al fresco dining for up to 10 guests while the bridge deck has a Jacuzzi, wet bar and barbecue grill, making the space great for entertaining or pre-dinner cocktails. 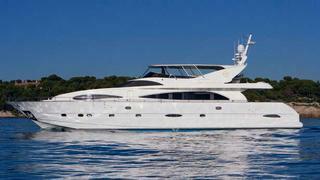 Twin 2,000hp MTU engines give her a cruising speed of 18 knots and maximum speed of 21 knots. Virginia Mia comes complete with a 4.45m Williams tender, Yamaha Waverunner, water skis and snorkelling gear. Lying in Hyeres, France, Virginia Mia has had only one owner since new and is asking €2,345,000.